I’m here to be a witness to your growth in discovering authentic wellness. I do this work because too many women walk around the world thinking they have to do it all, take care of everyone else and smile while doing it. I will hold the space to help you find your inner voice - your intuition - and lead an authentically abundant life. I don't practice one-size-fits-all therapy. I’ll follow your lead and use the creative process as a guide in sharing your experiences. I also believe that there is no “good” or “bad” in art therapy (I draw with stick figures), and even if you’ve never picked up an art material in your life, art therapy can work for you. I understand how hard it can be to make time for yourself, which is why I offer free, 15-minute consultations. Click the button below to get started. I always knew I would do something in the "helping world." In high school, I learned about art therapy and declared, to my friends and art teacher, that I would become an art therapist one day. After settling in to undergrad coursework, psychology alone didn't seem quite right. I knew the power of the creative process from personal experience and I revisited my declaration, trusting that a Masters degree in Art Therapy was the next step. After having my daughter and experiencing life as a parent, I felt a familiar calling. I knew that supporting women during pregnancy and early motherhood was important work. 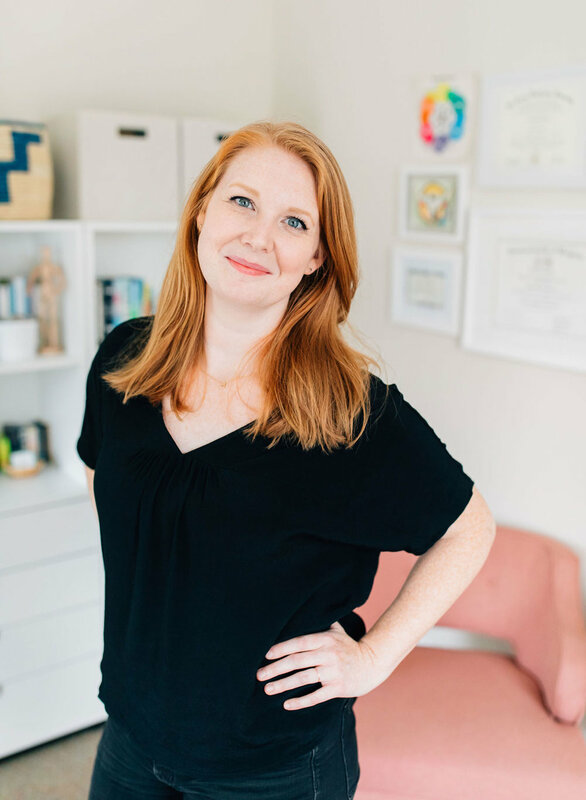 I opened my private practice in 2015, after several years working in mental health agencies, with the intention to serve other women, but I knew I could create a space to hold more types of healing and growth. It was then that my vision for a group art therapy practice was born. I do what I do at Alexandria Art Therapy because the world doesn't talk about maternal mental health enough. I’m here to support you, and other women like you, through these (often chaotic) years - to help you realize you aren't alone, what you’re feeling is common, and wellbeing is possible. If you feel like you “have it all,” but you can’t shake this nagging feeling that something is missing, I can help. If you feel overwhelmed trying to manage your multiple roles (mom, wife, daughter, friend, co-worker), I can help. If you’re struggling to get pregnant, be pregnant, or transition into motherhood, I can help. After your free initial consultation, individual therapy begins with a 50 minute intake session. Intake sessions are an opportunity to meet in person, explore your history and discuss your needs. I recommend weekly sessions for 4-6 weeks to establish consistency. Together, we’ll determine the best combination of art therapy and counseling to best meet your needs.